A new ceiling tile from Armstrong has helped give a new Scout bunkhouse new green credentials. 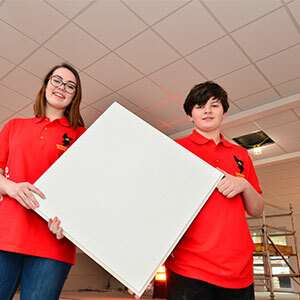 Ceiling systems from Armstrong, including a next-generation ultra-green tile, are helping to herald a new beginning for Scouts in one English county as part of Armstrong’s ‘New Beginnings’ initiative to support community projects by offering a “New Beginning” for their ceiling space. Armstrong’s new Dune eVo tile, which is 100% recyclable and provides class-leading visuals and improved acoustic performance through a new surface which is both brighter and smoother, has been used alongside moisture-resistant Hydroboard in a new bunkhouse for Derbyshire Scouts. The Cradle to Cradle™ accredited system comprising 190m2 of Dune eVo Tegular tiles on a Prelude 24mm grid with TLS cross tees features in the entrance, main hall and corridors of their 368m2 new bunkhouse, while the 56m2 of Hydroboard Tegular tiles feature with non-corrosive grid in the kitchen, shower rooms and toilets. 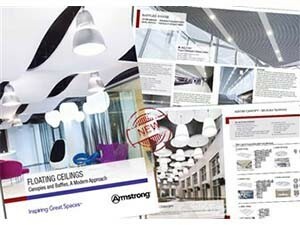 The various Armstrong Ceiling Solutions were specified by regular Armstrong users Maber architects and supplied free of charge by Armstrong as part of the company’s “New Beginnings” initiative. This gives community projects like Drum Hill Scout bunkhouse the chance to give their ceiling space a “New Beginning” with Dune eVo – the next generation in ceiling tiles. At Drum Hill Scout Campsite, they were installed over weekends by specialist sub-contractor Peveril Interiors, a member of Armstrong’s approved Omega network of installers. Lee Smith (pictured bottom left), associate director at Maber as well as a Scout Leader, said: “As a long-time specifier over the past 12 years working in architecture I trust and know the Armstrong product range will deliver what we want, giving us quality and robustness within our budget range. Maber’s brief was in essence to replace the previous building, Birch Hall, which stood on the site. They took the best features of other buildings on the site and of other camp sites internationally to create a modern, state-of-the-art camping bunkhouse. He added: “Firstly, we and members of the Scout campsite team used our connections to work with other professionals and tradespeople to find those who could help us. Through a collaborative design process we then designed a building which met the brief but was also future proofed and easily maintainable. This was a critical part of the brief as the whole campsite is run by volunteers. Future proofing has been key as the building will develop with technology and the needs of the users. We ensured the building fabric was super insulated to give the building longevity. This then allows us to add extra green features like the Armstrong Dune eVo ceiling tiles, grey water systems and PVs to the roof. The new single-storey bunkhouse at the 47-acre Drum Hill Scout camp site in Little Eaton replaces a former Rolls Royce canteen that had reached the end of its 50-year life span. It comprises a training/dining hall, kitchen and bunk rooms with associated services for up to 44 residents and will also be available for use by the local Derbyshire community. The result of five years of fundraising £200,000 as well as donations of products from companies such as Armstrong Ceiling Solutions, pro bono professional services such as the architectural design provided by Maber, and labour carried out by hosts of volunteers including Peveril Interiors, the new building has been achieved. Constructed of SIP timber frame on a ground-bearing slab with external brick plinth it features larch timber cladding and a profiled aluminium roof deck. Kevin Leahy of Peveril Interiors said: “We prefer to use Armstrong ceiling products. They have never let us down and adding the new Dune eVo tile to the range has gone down really well with both the clients who value the aesthetics and performance and our installation teams who value the new tougher edge which gives a much better installation experience. He added: “We were introduced to the team and the Scouts Association by a client of ours at Rolls Royce. Once we had visited the site at Drum Hill and understood the purpose of this building and what it would mean to the young people using it we felt we wanted to help the Scouts get the building completed to a very high standard and at minimum cost. Scout Leader and project manager Tom Stoddart said: “Armstrong Ceilings have been superb. From the first contact with Anthony Fawcett [Armstrong’s assistant sales manager, UK – commercial] their enthusiasm and support has been beyond our dreams really. They have just stepped forward and helped in ways that we hadn’t even imagined. “Without Armstrong’s involvement there certainly would have been a time delay while we fundraised for the materials and then it would have been an even longer time delay being volunteers who would have installed it. No disrespect to our volunteers but I’m sure we wouldn’t have got the professional finish that we have. Volunteer camp site manager and project manager Lesley Upton said: “I think it’s amazing what can be done by volunteers giving their time and companies supporting us to provide an outstanding building. “It’s great that Armstrong have a community side to their company that would actually support organisations like the Scouts in providing facilities for young people when we couldn’t do it without company support. Scout Felix Hughes (pictured top with Explorer Scout Libby Halford) said: “I think it’s a really nice place. It looks a lot better than the old one and it’s a lot more friendly and inviting. It will make a big difference because there is now a greater opportunity to do stuff than there used to be. As part of Armstrong’s “New Beginnings” initiative, the company is running a social media competition in May and June for one community-based project to win a new beginning for their ceiling space. Community groups interested in applying to win 250m2 of Dune eVo tiles and grid and up to three days of free installation should apply via https://www.armstrongceilings.com/commercial/en-gb/articles/evo-new-beginnings-competition.html?itid=eVoNewBegin-WhatsNewM2-BNR-article. For more information go to #eVoNewBeginnings. Derbyshire Scouts’ new bunkhouse will play host to a Scout and Guide activity camp for 1,500 campers over the Spring Bank Holiday weekend when it will be officially opened. Expert advice on the almost endless range of dramatic design and acoustic possibilities that can be achieved with canopies and baffles, including Optima Baffles Curves, the first curved mineral baffles in the industry, is contained within a new floating ceilings brochure from Armstrong.